We hate to play in the rain, don't we? But we're just crazy enough to still do it, aren't we? Well some of you out there may have never experienced it, but up here in the Pacific Northwest, there is a reason why we are always so green on the kids' maps. Yet we trudge on. Yet we swing. Yet we grip the clubs with our webbed fingers and turn up wet, sloppy divots instead of those wimpy desert-climate dry divots. So there. Yet, many times when it rains, we don't want to don some giant rain jacket or even get out an umbrella. This ClimaProof Provisional Rain Jacket by Adidas is perfect. 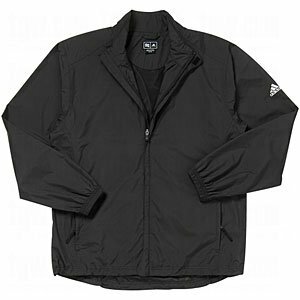 Lightweight at 100% polyester, and guaranteed to keep the golfer drier, this jacket can even fold itself into its own front left pocket for easy storage. It's also outfitted with long sleeves and elastic cuffs, and the unlined coat is truly wind and water resistant with a seam-sealed interior for full protection. A little feature that is very nice is the full zippered pockets and a drawstring hem to keep even some of the wet breezes out. It's a little hefty in price, but after all, it is Adidas, and you can sport the fancy logo on your arm and neck collar. But best of all, you can quickly unpack this little thing and play much more comfortably. You know, like a true die-hard-all-weather golfer.